The rise in the digital news industry has been global and its constant evolution is taking place in India too. Reports suggest that in the forthcoming years, the number of people who are digital literate and connect is going to hit the 4 million mark. India will soon be the world’s largest digital audience. Which is why, India is shoring up its digital infrastructure to help increased digital consumption of news. In a technology-driven digital news market with an ever-demanding consumer, there is a dire need for digital content that captures his attention in a highly competitive environment. For a digital news unit to be successful, it must have excellent narrative skills and attention-capturing style. Which is why staid old print media journalism is giving way to the New Media, news and features portals who are making their own space, often at the cost of then traditional print media. Vidyashree Dharmaraj, Editor-In-Chief, The Covai Post, has driven the city’s first news and features portal which has already touched the readership mark of 1.10 crore. Three years ago, Covai Post was recognized as the most trust-worthy news sources in the city and many of the stories broken by the Covai Post were picked up by the rest, including leading regional and national television channels. Covai Post has a team of richly experienced journalists, including in Tamil language, to produce the Tamil version of the digital publications. The TCP has in a short time, won several awards, including the award for the Best News Website/Best Digital Start-up Award. It has also been adjudged as the ‘20 most promising news portals’ in the country. In a conversation with Business Connect Magazine, Vidyashree Dharmaraj shares the ideologies, outlook, future and more about this promptly gaining popularity portal. Vidyashree: To keep pace with the changing times and adapt to the growing needs of the people wanting to get all important news at a click, we turned the TCP into a multi-media entity and focused on good video content. It makes me happy to say, many major news channels to source material from us. Sometimes, we are also commissioned to do special features. Vidyashree: The committed and experienced staff at the top to guide the team has naturally given it the edge and recognition. Fearlessly taking up issues of human interest that most portals and channels do not dare to do touch, we have become a much sought after portal for news and features, be it political, social, environmental or entertainment. To cite an example, our daring expose of the sufferings of the victims of the Coimbatore serial blasts, on the occasion of the 20th-anniversary of the blast victims. We faced several threats and were trolled badly. Our extensive coverage of this as also those on Jallikattu and the Toothukudi firing went viral and earned tremendous amount of goodwill for the media group and won viewership, not just in Tamil Nadu but across the world. Quality of videos and credibility have been our forte. The IT strength of our promoters only added to our technological advantage over the rest in then business. Vidyashree: Entrepreneurship in the business of media has been witnessing a major overhaul. Print has been giving way to online content. It makes competition tougher since technology keeps changing at an astounding pace. TCP has, to keep with the trend, gone in for umpteen updates that have helped it stay afloat. Multimedia content is one such transformation that TCP has adapted. The challenge remains to attract new readers and the retention of old ones. With the quality of and clarity in content, TCP has been trying its best, and successfully to a great extent, in attracting newer readers/viewers. Vidyashree: Yes, like all new ventures, there were teething troubles. Getting the readers to shift to the new format of online content was indeed a tough nut to crack. Worse, the daring attempt to go in for content, that others refused to touch, affected our revenue flow. But what we lost financially, we made up for gain in our credibility and earned a lot of goodwill. After this, it has been somewhat easy, but tougher all the same to continue to be in the news business. Vidyashree: We realized that the initial resistance from different quarters was proof that we were on the right track. This gave us the confidence to do what we were doing and make the reader expect something different every time. Business Connect: Please tell us something about your clientele. Mention some well-recognized names that could be published in our magazine. Vidyashree: The readers/viewers are of different categories. From the ordinary person on the street to business honchos, big names in the world of arts and films, the clientele has been wide. Vidyashree: Credibility has been our buzz word. Our readers/viewers are certain that what TCP puts out is true and that makes them look out for what we have to say. Vidyashree: As mentioned earlier, TCP is promoted by a software professional and part-owner of the software company AES Technologies has a global presence. Hence, adapting to changes in the world of technology has never been an issue with us. Business Connect: How much do you rely upon Research and Development? What is the role of research in the growth of the company? Vidyashree: Certainly, R&D is vital. As we are a media venture, we ensure that the staff members are kept abreast with the latest developments. We provide rigorous training to our staff so that they can go deep into subject content-wise, and work with technological precision. Vidyashree: Competition is to stay and will always remain a challenge. Giving content that makes us relevant, credible and different has been our guiding force. The criticism we face when we outdo others, coupled with the praise we receive for several of our content is reasons enough for us to stay motivated. Business Connect: Tell us something about your staff. How do you ensure their efficiency and positivity towards work in challenging times? Vidyashree: Motivation is what makes all try to do better. Constructive criticism, recognition to staff even when coming out with something above average will make them strive to perform better has been working quite well. This ensures positivity. Business Connect: What kind of activities do you conduct to keep your employees energized? Vidyashree: We have frequent get-togethers, cultural events that form part of festivities and we also give away Star Performers and Best Performer awards so that they are motivated. Vidyashree: After 20 years in the print media industry, the idea to switch over to digital was sudden but strong. Despite several pieces of advice otherwise, I went ahead conceiving the idea of presenting news in the digital format knowing well digital media is still too nascent in the State of TN. There is no specific person that I drew inspiration from but with Coimbatore being a city of entrepreneurs I thought that I would perhaps have it in me to venture independently. Business Connect: In recent times, many cutting-edge technologies such as IoT, AI, and Big Data have changed the modus operandi of business. How has it affected your company? Vidyashree: TCP comes from the stable of leading Coimbatore-based IT firm AES Technologies, which has global reach. This gives the portal the much-needed technological edge which gets reflected in the product quality. Business Connect: What are your contributions to CSR activities? Vidyashree: As part of the Coimbatore District Home Guards which is an auxiliary to the police department, we have been doing several initiatives for the tribal, the underprivileged and the needy. Business Connect: How do see the initiatives of present government with respect to your industry? Have they helped you in any sense? Vidyashree: While the government speaks a lot about digital media, they are yet to bring about modalities to approve or recognize online news portals so that the crowding of such platforms can be curbed. This will also enable the govt. to crack down on fake news circulated by unrecognized online portals. Business Connect: Enlighten us about the achievements of the company. 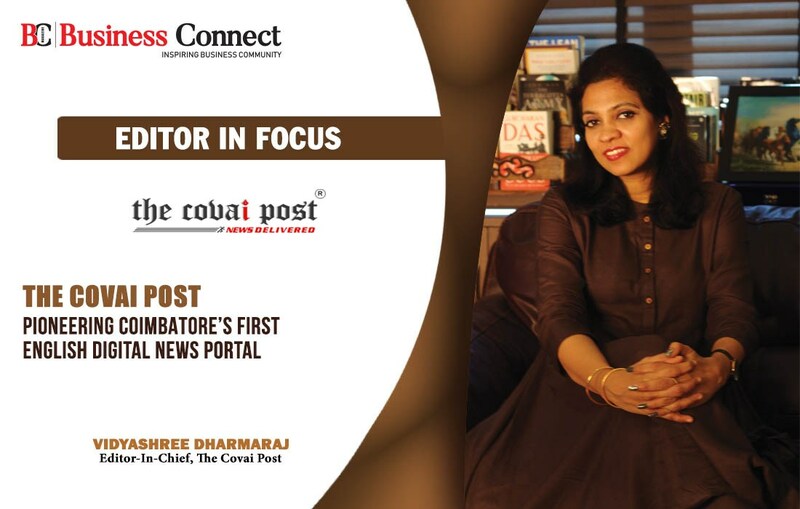 Vidyashree: The Covai Post, in a very little time of three years as a portal of its kind and the first in Coimbatore, has built a milestone for itself. The content is not just viral through their portal, it also gets hunted by aggregators in news like Times Internet, Daily Hunt, and the News Republic as well. We have got several awards, one of them being from an NGO for the ‘Best Online News Portal’ and in fact we have become a one-stop solution for news of all kinds from the business, economy, digital, technology to entertainment, political and international. We have also won the South India Start-up Award in 2018. The Covai Post has also been credited by the Guinness Book of World Records for live streaming the largest recycling lesson conducted at Coimbatore. Business Connect: What are the milestones of the company? Vidyashree: Three years is a short period for a small media firm out of Coimbatore to have milestones. Yet, our content is being shared by several news channels and portals and discussions are in the final stages for tie-ups with several channels and newspapers/portals for using our content which indeed is a major achievement for us and that too in a short period. Our Tamil supporting portal called Thandoraa remains a big source for regional channels and portals. Business Connect: What are your efforts to ensure the female workforce at par with male counterparts? Vidyashree: There are no extra efforts added, we naturally have more female staff co-workers than males which by itself is self-explanatory to explicit what bend do we encourage. Business Connect: What are your short term and long term future plans for the company? Vidyashree: In the short-term make our presence felt on a wider platform and in the long run come to be recognized as a global brand.